Whether next week will find you as the football party type or the bake-with-your-kids-on-vacation type, this recipe is for you. The dough is easy to make in a food processor, and you can use your slave labor little people to make the stuffed balls of dough. You just might want to double the recipe, though. These go fast. Prepare your pizza dough and let it rise. Roast chopped veggies of choice at 375 degrees for at least 30 minutes or until lightly browned. I used onions, garlic and mushrooms. 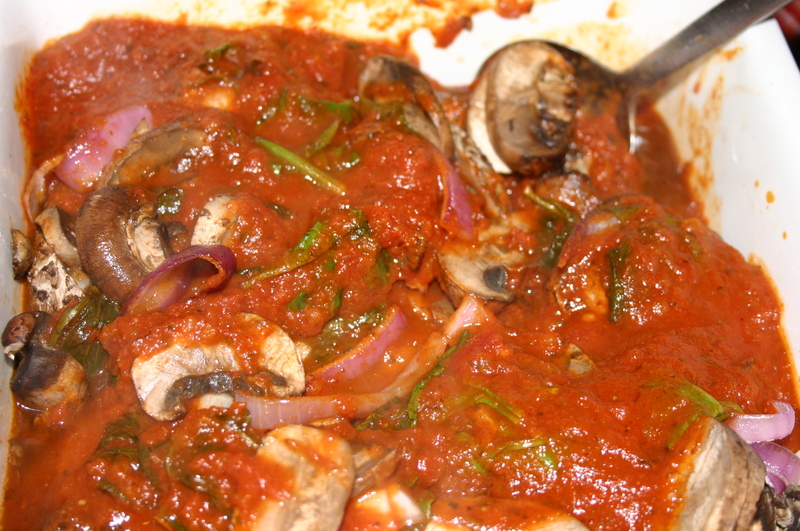 Warm your sauce in a pot and add the roasted veggies to it (I also added fresh spinach). Lower the oven to 350 degrees. Divide dough into many small balls and flatten like a pancake. 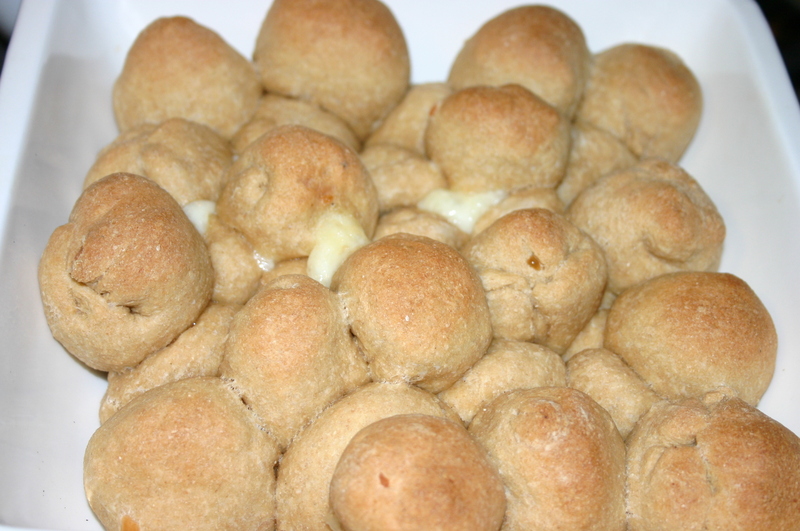 Add mozzarella cheese to the middle and roll into ball around it. It’s okay, even ideal, if some of the cheese sticks out. Place the balls in a pile in an 8×8 baking dish. Bake for 20 minutes. Serve the pizza bites and the sauce in separate bowls and let everyone dip. Mix the flour, gluten, salt and yeast in a food processor. While it’s running, slowly add the olive oil and the warm water. If the dough is not wet enough, add a little more, a teaspoon at a time. If it’s too wet, remove it and knead in a little more flour. Place the dough in a well-oiled bowl and cover it with a wet towel. Keep it in a warm place (like your oven with just the light on) for at least an hour. I want to live at your house and eat all your food !!! !